Apple diet is one way to lower cholesterol and improve lung function. Apple diet, it really does keep the doctor away; whether it's lung and bowel cancer you're concerned about, the health of your colon, diabetes or generalised inflammation in the body, this amazing fruit really does have a role to play. This page was updated by Dr Barrie Lewis DC on 18th October, 2018. 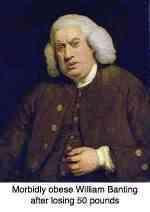 "The remedy oft in yourself doth lie." The European Commission recently has passed legislation to enable the apple diet in schools, for which the princely sum of 90 million euro has been set aside. Furthermore they plan to remove all junk food from schools and provide each child with a free apple or pear every day. Now that's putting your money where your mouth is. It's a sin against our children to make money for the school from tuckshops by providing junk food; who do we think we are fooling? Is it any wonder that the Western world has a diabetes epidemic, known as the white plague, threatening our children? They obviously think it cheaper than building new hospitals for the mountain of diabetic children who have sprung up in Europe since the advent of the sweet tooth that cola and snack companies have initiated. Will you do the same for your child? And yourself? It really is the best medicine. The old saying, that an apple a day keeps the doctor away, has profound basis in fact, as they have been scientifically proved to hold a preventive activity in bowel, lung and heart disease. Just consider the following; and it's all proven. Peas with honey, and red grapes with apples; make sure you have them regularly on the breakfast table, they are too are full of cancer prevention. Eight colors eggs Florentine with peas for breakfast. Life is heavy these days, perhaps it always has been for the majority of people. 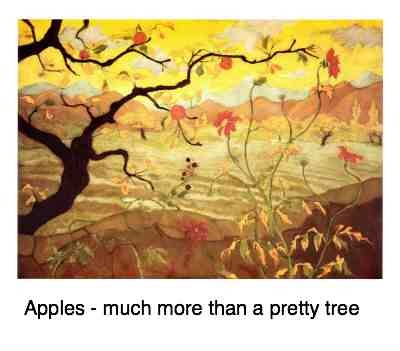 Cancer and autoimmune diseases are all about us; apple diet is part of the best medicine solution. Make time to laugh a lot too. Few things beat a sense of humour, an acceptance of the things we cannot change, and a determination to ring in those that we can. An apple a day is surely one of them. Much of that heaviness is of our own making. If we smoke, or allow ourselves to become obese then we know full well that pain will soon be our closest companion. Best medicine will help. Some of it is not. A car accident not of your own making, for example, and whilst much is known about cancer, much remains mystery; even those with the healthiest lifestyles still sometimes get seriously ill.
Part of my philosophy is learning to laugh at life and enjoy the best medicine; it comes out in my books. Despite our best efforts, S-H-one-T happens. After apples, laughter is the best medicine. 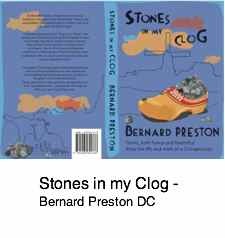 Just to let you know the Stones in my Clog ebook purchase was very fast and easy and is on my latest credit card statement exactly as expected! My 1st ever internet purchase ....done via PayPal. My girls will be proud of their 'old man' ...entering the electronic age! Really enjoy your writing style. The water soluble fiber in the pectin in an apple diet is a large part of its distinctive healing properties. Apple fibre called pectin is a complex carbohydrate; it's a 'resistant starch' that isn't digested in the small intestine producing glucose, but instead passes through to the colon where it is fermented by the bugs to healthy short chain fatty acids. Vitamins and especially Vit C.
The insoluble portion of pectin improves bowel health by increasing the bulk and water content of the large intestine; that reduces colorectal cancer, a leading killer of both sexes. The water soluble fiber in apple pectin is transformed into a gel in the gut. These soluble pectin gel fibres stabilise blood sugar (and thus is particularly good for Type 2 diabetics), reduce cholesterol absorption and blood pressure. They also provide an ideal environment for colon friendly bacteria. 75% of the fibre is found in the SKIN. Wash it thoroughly. Apple diet shows you the benefits of this not so humble fruit. The apple and the bicycle make a great team in the battle to keep healthy. They're good friends - if you use them! At Chiropractic Help we are concerned about the whole body, and not just your spine. While an adjustment may help the function of your bowel, it is clearly also important to be enjoying a healthy diet and getting plenty of exercise. Health is additive and better health means contributing as many positives as possible, and minimising the negatives. Of course, there's the mind and spirit to add to freely mobile joints, a tip-top bowel and good physical shape. Research at the John Hopkins Medical Institute found that water soluble fiber lowers both cholesterol (interestingly, only the ‘bad’ part of cholesterol, called LDL, but not lowering the ‘friendly’ cholesterol HDL). In fact, apple pectin actually raises the friendly HDLs. - so does exercise. EXERCISE AND CHOLESTEROL and blood pressure are very much connected. Oats and apples both provide excellent water soluble fiber for the gut. Research in Russia compared two groups of patients hospitalised with serious gut infections. One group was given antibiotics, and the other antibiotics and apple pectin. The second group were discharged 2-3 days sooner, on average. Pectin has a bacteriostatic effect. A Ukraine study found that apple pectin binds toxic heavy metals in the gut, preventing them from being absorbed into the body. Yet another study found that apple pectin reduced inflammatory disease of the gut. An inverse association may exist between lung cancer risk and foods containing quercetin, found in high concentrations in apples and onions. More apples and onions, less lung cancer. Researchers have found an inverse relationship between lung cancer risk and food sources high in a key substance, quercetin, found in onions and apples. A study of 2512 Welsh coal minors found that lung function improved significantly with consumption of five apples per week. Highly allergic? Asthma? Hayfever? Researchers in Switzerland have found that white mice bred to be highly allergic have much less allergic symptoms and signs if they FIRST eat some raw apple in the morning, half an hour before anything else. Eating the apple with or after breakfast brought no benefit. Bone loss is reduced by phloridzin, a polyphenol found exclusively in apples, especially in the peel. "Any powerful idea is absolutely fascinating - and absolutely useless unless we choose to use it." Will you start eating an apple a day? 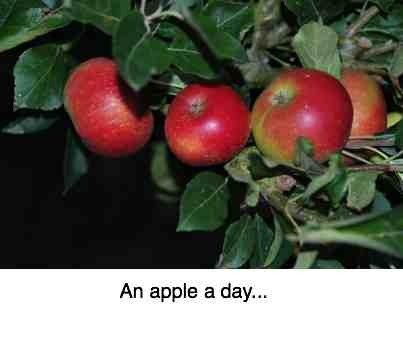 Perhaps half an apple? It will keep the doctor away you know! How does the apple diet actually work? The antioxidant quercetin plays a major role in affecting lung function and lowering the risk of lung cancer. In also prevents the formation of oxidised cholesterol in the gut, the very most dangerous form of cholesterol, that causes atherosclerosis, a killer. Apple Pectins have been shown to have a pronounced anti-mutagenic effects. They protect cells from cancerous change. Apple pectin decreases the incidence and number of colon tumours by lowering a destructive enzyme which forms a key step in carcinogen activation and tumour initiation in the colon. Apple pectin is a bulk-forming agent and prevents both diarrhoea and constipation by a similar mechanism. Pectin in the apple diet modifies intestinal toxic bacterial enzyme activity in the gut, contributing to a protective effect against colon cancer. Water soluble fiber such as that found in apple pectin is known to decrease inflammation as measured by a a blood test for C-reactive protein . This protein has been associated with wide spread diseases such as Alzheimer's, cancer, diabetes and heart disease. Another of God's gifts for the gummed up colon is beetroot constipation. Fruits rich in pectin also include the peach, currant and plum. There's a huge amount of research being done world-wide on the benefits of a healthy colon; along with plenty of fibre to give it bulk and a fresh diet for the microbiome, you need a steady supply of bacteria and yeasts from your food. You can either take supplements, or make your own. Kefir is fermented milk that is rich in more than thirty different strains of bacteria and friendly yeasts necessary to digest the fibre such as pectin. Use the site search function to find out more about kefir benefits. 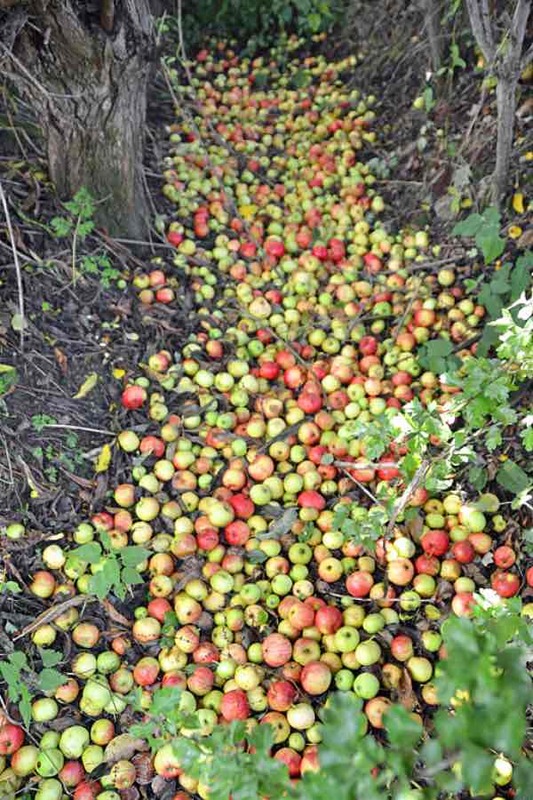 These English apples were left to fall and rot, simply because they didn't meet the must-be-perfect standards set by Brussels. Why weren't they at least pressed for apple juice or brewed into cider. 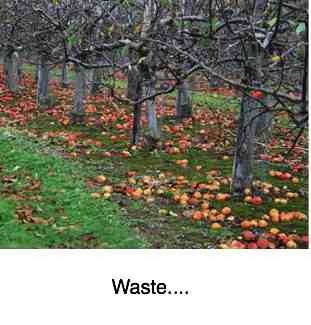 Such waste... or even fed to pigs and horses. Why Apple diet on a Chiropractic Help site? Chiropractors are 'primary contact practitioners', meaning you don't need a referral letter from your doctor. So our patients usually find their way to us because of a pain somewhere, but addressing constipation, weight loss, exercise, raised cholesterol... is vital. Honest injun. A poor diet is as hazardous for your health as poorly managed subluxations. Heresy - maybe even worse! You need some good compost, and a strong back for digging the hole if you are planning on planting apple trees. Quick constipation relief - research proves that prunes are more effective that the most commonly prescribed medicine.